The latest Ordinance on the National Eligibility and Entrance Test (NEET) by the government hasn’t actually resolved the confusion over the admission process to medical seats in various institutions in Andhra Pradesh and Telangana. Thousands of students and their parents in the two states are keeping their fingers crossed, as the medical seat aspirants are now compelled to take NEET-2 and also the medical entrance tests conducted by the respective states. The first phase of NEET was conducted on 1 May, by which time the Supreme Court had not provided clarity on the objections raised by different states. Considering the requests from several states, the union government promulgated an ordinance exempting the states from filling the state quota of seats in government and private medical colleges for this academic year. Therefore, another NEET-2 exam was scheduled for 24 July. The students aspiring to join the medical courses under management quota and NRI quota in private medical colleges will have to essentially appear for the NEET-2. The governments of Andhra Pradesh and Telangana have made it clear that the merit seats (EAMCET convener’s quota) in private medical colleges would be filled only from the ranks of EAMCET (common entrance test) of the respective states. Accordingly, 825 seats in the convener quota in AP and 725 seats in Telangana will be filled through EAMCET ranks. While AP has already completed the conducting of EAMCET and announced the ranks of medical stream of students also, Telangana will conduct EAMCET (medical stream) on 9 July. A notification to this effect was issued. There are 22 private medical colleges in Andhra Pradesh and Telangana combined. While 50 percent of the seats were filled through merit in both states under the quota of respective EAMCET conveners, the managements of these private medical colleges used to fill 35 per cent of seats through special entrance test. The remaining 15 per cent of seats earmarked for NRI (non-resident Indians) quota are filled by the respective college managements at their discretion. A deemed medical university and one minority medical college in AP and two minority medical colleges in Telangana have so far been filling the seats using their own discretion. They are outside the ambit of EAMCET or the entrance test conducted by private medical colleges. Now, these 2,100 seats – management quota seats in private medical colleges and seats in minority institutions and deemed universities – will have to be filled from the merit lists of NEET. In all, there are medical seats 2,600 seats in Telangana and 3,500 seats in Andhra Pradesh. The private managements are contending that the NEET Ordinance had no specific mention of the NRI quota. Therefore, they would be filled at the discretion of the managements only. Neither the government nor the courts have clarified the position on this. 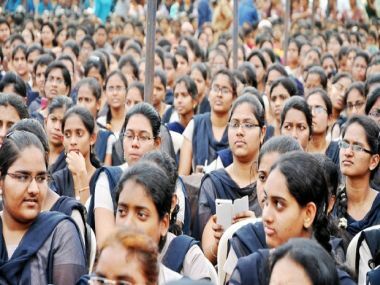 Students who secured good ranks for which seats are assured in the regular process (over 2,200) in AP would not take the test, though, says Kamineni Srinivas, Minister for Medical & Health, Government of Andhra Pradesh. But all students in Telangana will be forced to take both NEET and EAMCET. Meanwhile, the private residential colleges and coaching centres in both states have introduced crash courses for NEET as students are unfamiliar with the pattern. The fee is ranging between Rs. 20,000 and Rs. 30,000 for the next six weeks. Executive Dean of Sri Chaitanya Educational Institutions V Kumar told Firspost that the private residential colleges (coaching centres) were, in fact, imparting training to students appearing for NEET for the last three years. However, with the current situation forcing the students to take NEET for admission into private medical colleges, the crash courses were introduced. Along with Sri Chaitanya, another chain of institutions that impart NEET crash course is Narayana Group, which is promoted by Minister for Municipal Administration in AP Government Dr P Narayana. Kumar said that this clarity of NEET should have been provided in December or January so that the students would have prepared accordingly and there would not have been any confusion. However, now the students are under pressure to take the two examinations of two different patterns. Naturally students would be under pressure during examination season and this has compounded it. The format of the private medical colleges’ entrance test, which was now done away with, was actually identical to EAMCET, he says. One saving grace is that the NEET merit lists are given in two formats. One is the national merit list and the other is the merit list of the respective states. This has eliminated external competition, according to him. Pradeep, a doctor himself and a parent of medical seat aspirant, says that the governments have been experimenting with these entrance examinations for decades and how many times “we haven’t seen these examinations getting embroiled in controversies and caused confusion.” There is no scientific approach and students suffer because of this year after year.